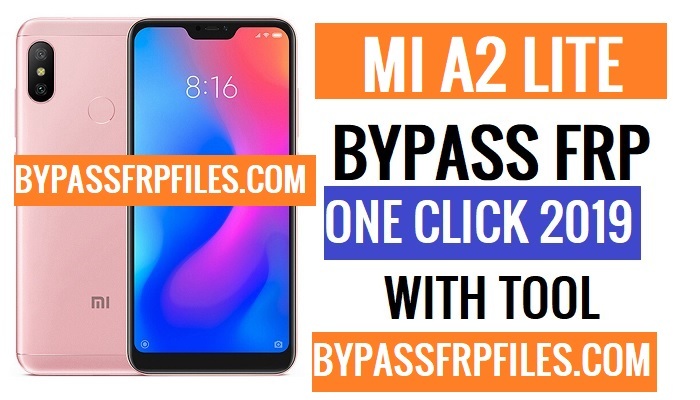 Now today we are here share with you another latest method to unlock FRP from Redmi 6 Pro, so how you can do it, just follow this process if you want to Bypass FRP Mi A2 Lite, ok first of all you need to download some files and Mi A2 FRP tool, we also check the without PC method but that process have too much process, but this method is one click unlock FRP process. FRP is (Factory Reset Protection) for our Latest Android devices, if you forget the Pattern, Password and fingerprint lock for this you have to hard reset your device by using keys, after you hard reset your device then you need to enter the previously synced Gmail ID to using your access your device home screen once again, then why we need to Bypass? its very simple answer if we forget the Gmail ID that we enter synced previously on our device, then you need to Bypass FRP Mi A2 Lite and use our device once again. Download all the files from here before you started to Unlock FRP Mi A2 Lite. we are here share only one link to download the files just click on the link and download all files for free. -Once you download all the files then extract all the files to your PC by using WinRAR. -Then install the “Qualcomm USB Driver” to your pc. -After that, Open the extracted frp tool folder. -Then there you will see “Qualcomm Tool” folder. -After that, open that folder, and then you will see “Birthday” folder, then there you will see “QUL tool.exe”. -Then select the “Mi a2 lite.mbn” file there. -Now put your device in EDL Mode to Unlock FRP Mi A2 Lite. -To Bypass FRP Mi A2 Lite first of all power off your device first. -After that, see the below image to put your device successfully into the EDL mode. -Just “Sort the two pin” and connect your device to USB cable. -Then right click on the “Manage” then click on the “Device Manager” and then click on the “Port”. -Now there you will see something like this “Qualcomm HS-USB QDLoader (9008)”. -This mean you have successfully connected your device to Unlock FRP Mi A2 Lite. -Ok Now follow the final process. -Then click on the “Remove FRP” button. -Ok, once all the steps you did successfully. -Then your device will be rebooted. -Once rebooted then full step up your device. -Now check you will successfully Bypass FRP Mi A2 Lite. Thanks for visiting us, Comment below if you face any problem With Unlock FRP Mi A2 Lite, we will try to solve your problem as soon as possible. you can check other some tutorial here to help you.